Are you ready for some old-school hard-core making? Take a good look at what you're wearing, nearly everything is knitted! After seeing this post on my favourite site I decided I wanted to do this. The mechanics of this 30 year old machine are just from engineering perspective magnificent. Cams pushing needles out, depending on the needle position.... Adjustable tension.... Adjustable size of the stitch (stroke of the needles).... Timing of the needles.... If you like mechanics you'll appreciate a knitting machine. 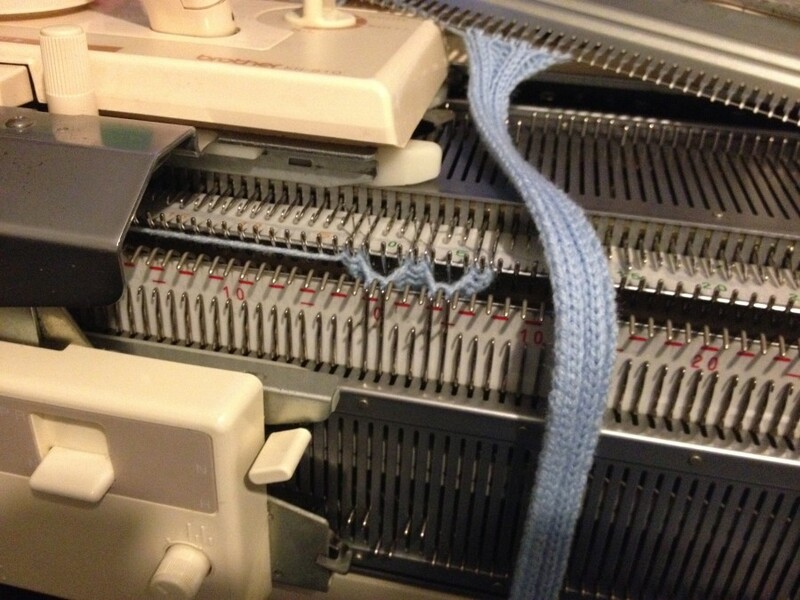 I searched on marktplaats.nl and found a Brother KH-910 knitting machine (actually 2 of which the second one for spare parts), and a lot of extra's. Including a KR-850 ribber bed, KRC-830 Colour changer and a box full of yarn. In the process of buying the second hand machine (nearly 30 years old !) I ordered the AYAB shield and an Arduino Uno. It took a sunday afternoon to get my first knittings from the machine, and while waiting for the electronics to be delivered I started getting familiar with knitting. In a matter of one morning (of which most of my time consisted of getting the needed python libraries installed on my Mac) I got something in 2 colors out of the machine. Some tweaking of the hall end-sensors which detect the end position of the carriage and everything worked. 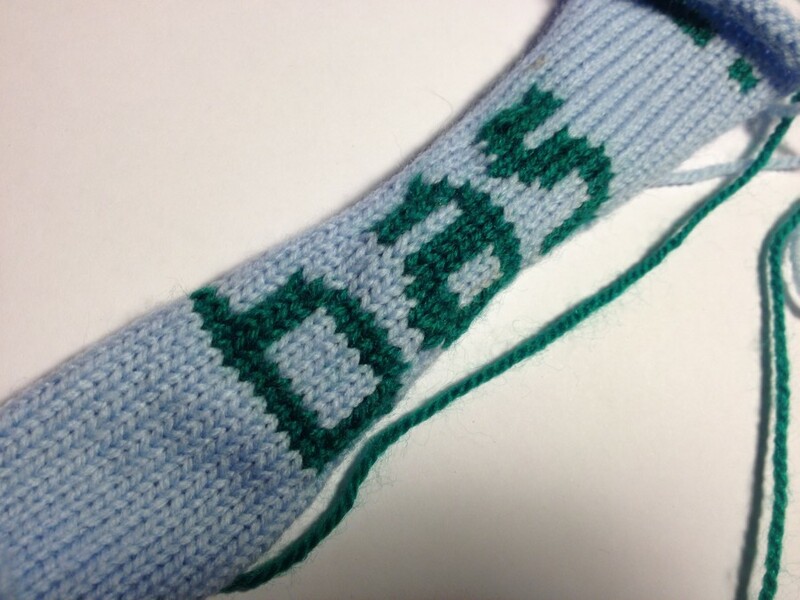 I need to delve in the actual control and electronics about why this works (I first neeeeded to knit something). Because there are only 16 solenoids who drive 200 needles. But forget about that for now, I'll open the spare machine at a later time. I know the needles are sensed by the electronics (like an encoder, sensing left/right motion) and it seems there is a 3rd sensor sensing banks of 16 needles. Just have to investigate. This entry was posted in knitting and tagged ayab shield, brother KH910, knitting, MachinekNit by Bas de Bruijn. Bookmark the permalink. Cool! Definitely on my sometimes-wishlist! Maybe they use a solonoid matrix, like when driving a LED matrix? But still, 16 solenoids in a matrix would still yield to few combinations. I'll open it sometimes these weeks and see what's in it. Maybe some punch-card machines have the same electronics, they (and the KH-9** series) are regularly offered on Marktplaats. The 16 solenoids work in a repeating sequence but only the needles under the carriage are destined to move so it only needs to prepare the stopping bars a few needles ahead of the work zone in either direction. It seems 16 needles is enough of a work area. The absolute position is determined by the perforated belt feedback and the end stop hall effect sensors and magnets on the carriage. The KH-9xx units all have some form of electronic control as well as one of the chunky wool machines (KH-270).